Last week I posted a list of my top 10 favorite things to draw, and I mentioned on point 10 that I would get back to you with a story. Well here it is. Now, the funniest part about this whole list of “Things I like to Draw and Paint”, is that I happen to like pinwheels. So over the last several years, every now and then, I’ll buy myself a pinwheel from the Dollar Store. My daughter always teases me about my “pinwheel collection”, as she calls it. But, I keep telling her that I am not collecting them, I am buying them for reference material. I buy them because I have an idea in mind that I want to use them for a painting, but I just haven’t gotten time to paint it yet. Well, I don’t have any evidence of ever painting a pinwheel from the last post because I really hadn’t gotten around to painting any. Currently, I am working on a new watercolor painting. I decided to paint a series of sea themed paintings. This is the first one in the new series, Seashells at the beach. 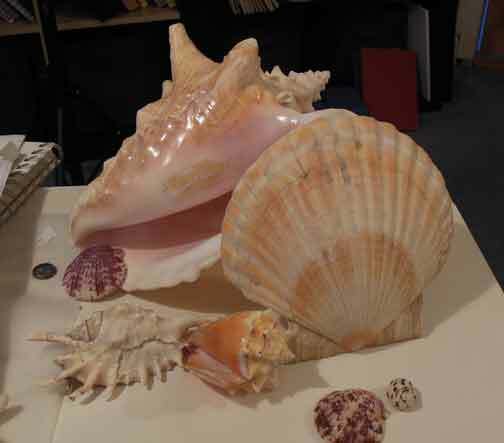 I have lots of great reference material for inspiration and watercolor and gouache is a great medium to use for painting seashells. One of the most interesting and inspirational things to me as an artist is to discover and learn how other artists work. So for today’s blog post, I thought I would show a couple of photos of my own paintings in progress. Before I even start a painting, I will do lots of sketches planning out my composition. Simultaneously, as I decide what I want to paint, I will also go through my large reference file of photos for inspiration. This painting, of the pink flowering tree was a gorgeous tree that was planted at our old home in Pennsylvania. 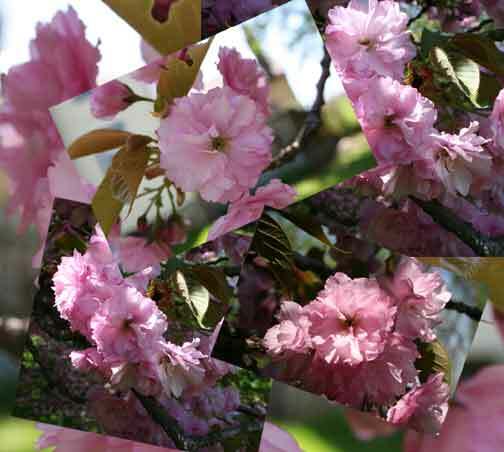 Every spring it would blossom in beautiful pink flowers. The tree always seemed so loaded down with flowers. I don’t know the name of the tree, but I knew that someday I was going to paint it.